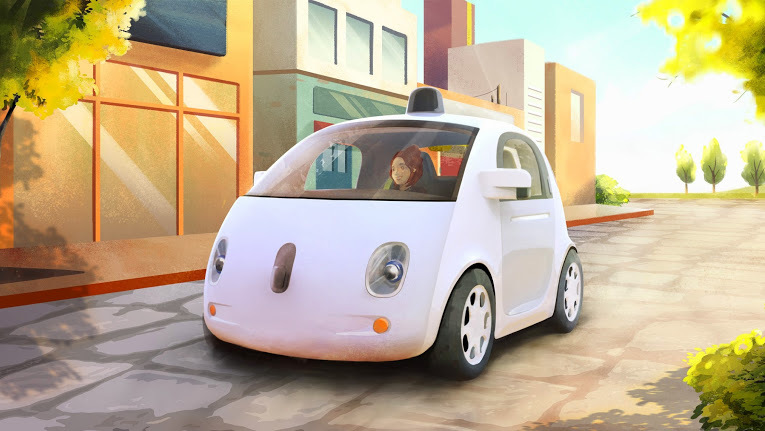 Google has been secretly working on a car. We knew that they were working on autonomous vehicles, but they have also been redesigning the car for an autonomous world and came up with a pod car. The design will be familiar with those who have been following Personal Rapid Transit, though an important difference is that it is in principle trackless (or rather the entire road network has been sufficiently mapped in detail so the whole world is track, rather than bespoke track). The newest vehicle is designed for slow speed (25 MPH) on campuses, and is especially light. The low mass is important as it saves energy but also causes less damage when it accidentally hits something or someone. Combining the low mass with the lower likelihood of a crash at low speed will magnify its safety advantage for non-occupants in this environment compared with faster heavier vehicles (which privilege the safety of the vehicle occupants). While I had been assuming the first market for autonomous or semi-autonomous vehicles would be the relatively controlled environment of the freeway, the relatively controlled environment of low-speed places makes sense as well. These are two different types of vehicles (high speed freeway vs. low speed neighborhood), and though they may converge, there is no guarantee they will, and perhaps today’s converged multi-purpose vehicle will instead diverge. There has long been discussion of Neighborhood Electric Vehicles, ranging from golf carts to something larger, which are in use in some communities, particularly southwestern US retirement complexes. 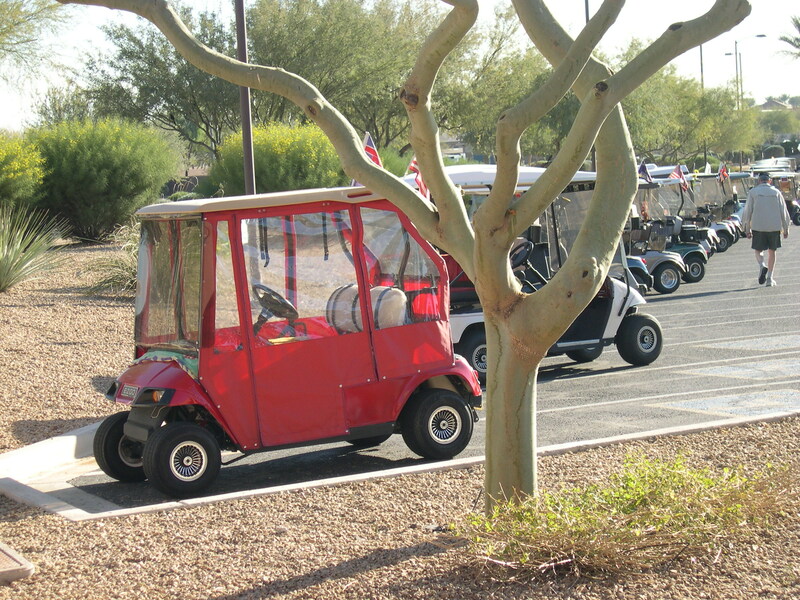 In Sun City, Arizona, for instance, people use the golf cart not just for golfing, but for going to the clubhouse or local stores. They can do this because local streets are set with low speed limits, and there are special paths where they are not. Note that many of these places have gotten a bad rap from the current flavor of urban planning which decries non-gridded networks. However keep in mind that non-grids have the advantage of discourage through traffic. 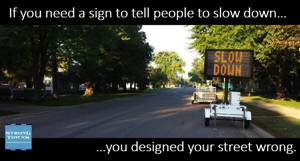 Perhaps roads are too wide or too fast in these places, but that is much easier to fix through traffic calming than a too connected network. We will not only be able to deal with such ideal places. We will also need to do retrofits. So will people buy such cars with limited speed? Many will as a second or third vehicle, as they already do with golf carts. The arguments are very similar to those about electric vehicles. The opportunity arises with Cloud Commuting, when such cars, as they are autonomous, come to you. They will be dispatched when they are practical for the trip at hand, which may either be a short distance within a `slow space place’, or can travel along a `slow path’ between nearby places. This slow path is of course faster than bike paths and sidewalks, but slower than Principal Arterials and freeways. Retrofitting cities for transportation has a long history, cities and transportation co-evolve. We redesigned our cities, which had originally emerged with human and animal powered transportation, first for streetcars, and then for the automobile, and in some larger cities for subways. We have also redesigned our taller buildings for escalators and elevators. We did not however redesign cities for Segways. We have already differentiated speed on links, and setting speed limits is one of the key jobs of the traffic engineer in ensuring safety. This is not only on the link in question, but important for other links as well. Travelers shifted away from freeways and onto less safe rural roads when the speed limit was set to 55 MPH in the 1970s, and back when it was raised in the 1980s, improving overall safety, though not necessarily safety on the freeways themselves (See Lave and Elias 1994). As part of an expansive budget bill signed into law last week, state lawmakers nudged transportation officials to boost the speed limit to 60 miles per hour on lane miles where it can “reasonably and safely” be done. By 2019, traffic engineers must examine every mile of road with a 55 mph limit and determine if it is prudent to go higher. It’s an enormous undertaking. There are 6,771 miles on two-lane/two-way state highways now covered by a 55 mph limit. Officials figure they’ll get through about one-fifth per year, starting as soon as next month. They will analyze each stretch’s crash history, design, lane width, sight lines and ditch slope. “The fact we’re studying the roads does not mean you can jump to the conclusion that all roads will be raised to 60 miles per hour,” said Peter Buchen, assistant state traffic engineer at the Minnesota Department of Transportation. But the agency has been moving in that direction. In 2005, the department bumped the limit to 60 mph on 791 miles of two-lane highways and added another 750 miles last year. Buchen said those were prime candidates — straight, wide-open stretches with clear sight lines and low incidence of crashes. He said limits on hillier, curvier highways probably won’t budge. Axiom 1: Some roads should be fast – The aim of transportation is connecting people with destinations. They can connect with more destinations if they can do so in less time. Ceteris paribus, faster roads will take less time. Axiom 2: Some roads should be slow – Some roads serve neighborhoods and have traffic that is not just motor vehicles. Ceteris paribus, slower roads are more likely to ensure safety, a high quality of life, and increased interaction within the neighborhood. Without loss of generality, let’s call these roads streets. Axiom 3: Fast roads attract traffic from slow roads – In general, people prefer to spend less time traveling, and will spend less time on faster roads. These roads will attract more people. There will be net reductions in traffic on streets that are made slower and net increases in traffic on roads that are made faster. We thus should redesign our road hierarchy with these axioms and the possibility of slow vehicles becoming mainstream, developing a slow network so that these neighborhood vehicles cannot not only travel within neighborhoods or on campuses, but between them.